BMW’s redesigned 1-Series hatchback sold mostly everywhere except here likely will not see the light of day here in North America. Despite premium hatch offerings from BMW’s rivals such as the B-Class from Mercedes-Benz and the A3 from Audi, BMW says that selling a 1-series hatchback here would be too expensive as it would be put into 3-series pricing territory. So does that mean no 1-series at all for North America? Not quite. The current 1-series sold in North America, which only comes in coupe or cabriolet, will now be called the 2-Series as it grows in length. And unfortunately for BMW some sneaky photogs got their lenses on the new 2-series completely undisguised. The end result is a sleeker body with design language more in line with the company’s new corporate direction. An agreeable look. No word on any specs, but there is a rumoured M235i being tossed around and of course a non-M 235i which may make as much as 320 horsepower. A 228i will likely feature the engine currently used in the 328i, which is a 4-cylinder producing 240 horses, and it’s a safe bet to assume both an 8-speed automatic and a 6-speed manual will be made available. No word on whether or not X-drive will find its way onto this coupe. 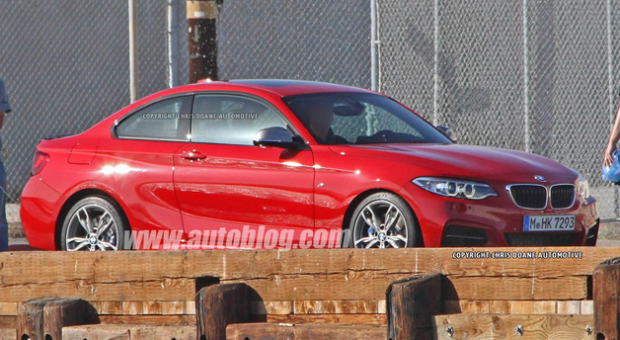 Expect the new 2-series to officially start production in November of this year.